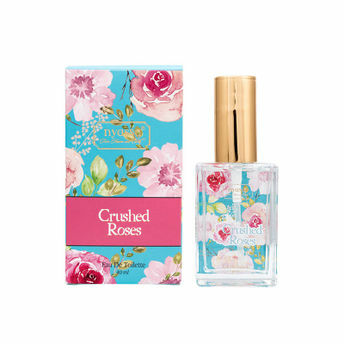 Immerse yourself in the enchanting fragrance of roses with Nyassa Crushed Roses Eau De Toilette. This beautiful perfume makes you experience desire, delight, sweetness and innocence, all from just a whiff of crushed roses. About the Brand: One of the premium manufacturers of natural bath and body products, Nyassa creates beautiful and fragrant products that infuse divinity and pleasure into the mundane and ordinary rituals of life. Being Nyassa is a philosophy encapsulated in the words 'from heaven and earth'. Nyassa products are formulated by blending pure and natural ingredients with rare and exotic fragrances to offer their users a complete and unmatched mind and body experience. Wholesome natural active ingredients such as essential oils and extracts go into the making of all Nyassa products, along with some of the most unique and mystical fragrances sourced from around the world. Today, the brand offers a wide range of skin, body and hair care products, along with an exciting range of home fragrance products. All of them are free of SLS, SLES, paraben or any preservatives and are not tested on animals. Explore the entire range of Perfumes (EDT & EDP) available on Nykaa. Shop more Nyassa products here.You can browse through the complete world of Nyassa Perfumes (EDT & EDP) .